Happy Birthday, Tiger: Best Golf Courses in the U.S.
On Dec. 30, 1975, a man by the name of Eldrick Tont "Tiger" Woods was born in Cypress, Calif.
Thirty-eight years later, this man has changed golf history, going on to win 14 majors and 79 PGA Tour events (both marks second all-time) while donning four green jackets at Augusta National Golf Club. In honor of Tiger Woods and his historic accomplishments throughout his career, here are the best golf courses in the United States today. May as well start with the obvious. The host of one of the most famous golf tournaments in the world, Augusta National Golf Club is a gem co-designed in 1933 by the great Bobby Jones. The course is surrounded by magnificent trees and plants and extraordinary beauty. In fact, you can get an idea of the course layout by the names of the holes, from Tea Olive to Carolina Cherry to White Dogwood. You will also see "The Big Oak Tree," Eisenhower Tree, Ike's Pond and Rae's Creek. How revered is Augusta National Golf Club? It's the only course to host one of the four major tournaments each and every year. There are only a handful of golf courses in the world that can challenge Augusta. Pine Valley Golf Club is one of them. Consistently ranked as one of the top golf courses by a host of publications throughout the years, Pine Valley is not only one of the most well-designed links, it is also one of the most varied and challenging. It is built in such a way that you are challenged to use just about every club in the bag, and different schools of design can be seen on a single hole. Surrounded by pine trees, lakes and rolling hills, it's hard to believe Pine Valley was designed by a bunch of amateur golfers in 1913. Located on the coast of Pebble Beach in scenic Monterey County, Cypress Point Club is a sight to behold, boasting incredible views of cypress trees, jagged coastline and sweeping sand dunes. Consistently rated as one of the best golf courses in the world, Cypress Point has become a go-to destination for golf lovers. Good luck concentrating on the actual game of golf, though. Sometimes your mind can wander, surrounded by the incredible beauty this destination offers. Surprise, surprise—another Pebble Beach golf course made the list. Pebble Beach Golf Links has become one of the premier golf spots in the nation since its arrival to the scene in 1919. It sports epic views of nearby Carmel Bay and the Pacific Ocean and the holes are set up splendidly, whether you are knocking the ball across the waters or striking from a cliffside onto the greens below. Hugging the coastline, Pebble Beach Golf Links is yet another prime example of the serenity and awe-inspiring beauty Pebble Beach offers. Merion Golf Club sports two courses, but it is the East Course that has gained worldwide acclaim throughout the years. The host of the 2013 U.S. Open, the East Course comes complete with lush green trees, creeks, yellow and green brush and grass, and carefully designed bunkers. And for those of you who don't like to walk a lot, Merion is so compact some have compared it to a jigsaw puzzle. The holes on the course are right next to each other. And to add a little intrigue, Merion famously (or infamously) uses wicker baskets on top of the poles instead of flags. 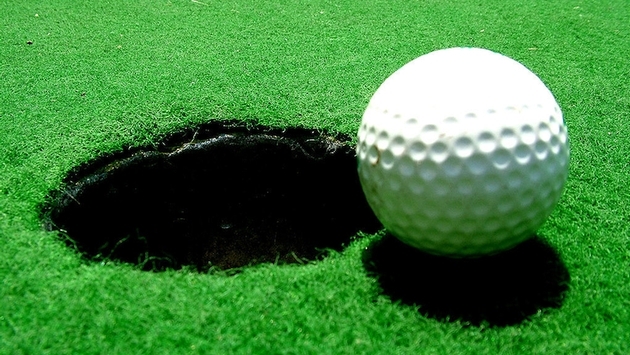 Golf shots have been known to hit the baskets and take random bounces, adding to the course's difficulty. It hasn't taken long for Sand Hills Golf Club to make a name for itself since opening up in 1995, despite being in a remote location. Fitting in with the great open expanses of Nebraska, Sand Hills is unique in that it features a minimalistic design…and does so very well. You will find some of the greatest sand dunes in the United States here, towering over golfers. Coupled with the rolling green hills and wide-open skies, there's a calming feeling about this place. Better study those approach shots or it won't be very calming after long, though. Oakmont Country Club has undergone a wealth of changes throughout the years. It was first designed with no trees to resemble the links of Great Britain. Then, thousands of trees were added, before they were deforested to center back on the course's original design. But through all the changes, Oakmont has stood the test of time. Complete with deep bunkers, incredibly fast greens and tight fairways, Oakmont is not only well-designed, it's also one of the most difficult courses in the U.S. Club founder Henry Fownes once famously said of the course, "A shot poorly played should be a shot irrevocably lost." Highlighted by the rolling hills of Long Island's south shore and the great winds from the Atlantic Ocean, the coastal Shinnecock Hills Golf Club boasts plenty of natural beauty. The architecture isn't bad, either. In fact, it's so well-designed that it's been virtually untouched in the last 50 years. Shinnecock also boasts the title of the oldest golf club in the U.S., dating all the back to the 1890s. Shinnecock has already hosted the U.S. Open four times in its history, and it will once again be the site of the U.S. Open in 2018. Located between Shinnecock and Peconic Bay, National Golf Links of America is a links-style course established in 1911 that expertly incorporates the best parts of the courses in the British Isles. The spectacular course (which still doesn't get enough credit) has one of the most complex layouts in the country, from the massive bunkers to the quick, undulating greens. Add the fact that it features blind shots and several ponds to spoil the party, and you have yourself a highly difficult course. Whether it be the challenge of the approach shots or the sweeping views of the picturesque Peconic Bay, National Golf Links of America satisfies a wealth of criteria to be named as one of the top 10 golf courses in the United States. Pinehurst Country Club boasts eight courses overall, but No. 2 in the most famous. It is widely considered to be one of the most scenic golf venues in the U.S., from the tree-lined fairways to the ponds and bunkers scattered throughout. And watch out for those quick and complex greens; they have the tendency to be mighty difficult. Pinehurst also holds the title of hosting the most single golf championships than any other course in America and will be the site of the 2014 U.S. Open.